In the morning of March 22, 2019, a British passenger of the "Hypatia de Alejandria" fell into the sea between Mallorca and Ibiza while the ship was enroute to Palma de Mallorca. Upon the arrival in port it was remarked that the 30 year old man was missing. He had last been seen at 5 a.m. An SAR operation with a helicopter and two SAR boats was launched. Also a helicopter of the Guardia Civil and a French aircraft, which was by chance in the area, joined the search. 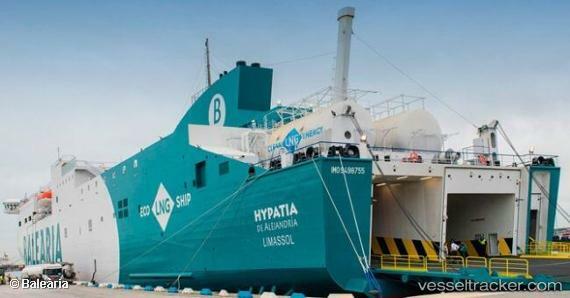 The Hypatia de Alejandría de Baleària, the first smart ship powered by liquefied natural gas that sails in the Mediterranean, makes its first commercial trip between Barcelona and Palma tonight. The ferry arrived last Sunday night at the port of Barcelona, coming from Venice, where the shipyards in which it has been built are located, Cantiere Navale Visentini.